Harry Reid on Federal Budget: "It's Time To Set Aside Partisan Differences"
Senate Democrats have now requested going to conference 17 times in order to deal with the pressing issue of the federal budget – and each time, a Republican senator has objected. “The economy is at risk. 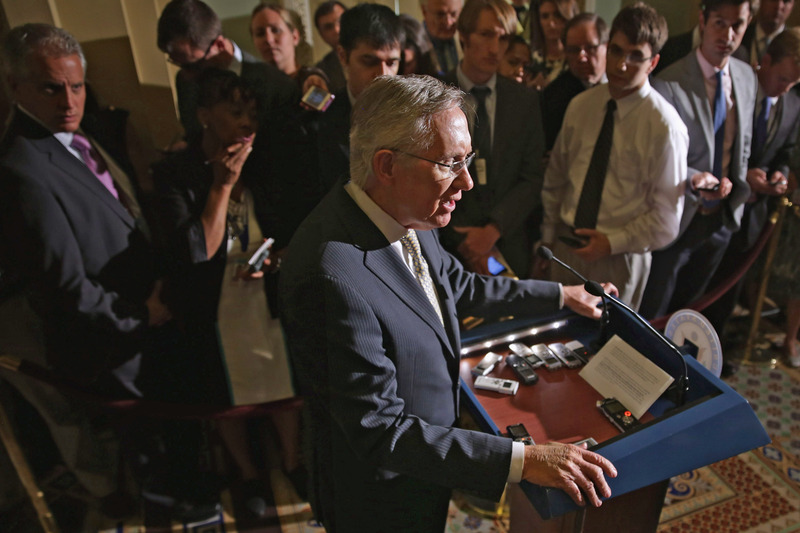 It’s time to set aside partisan differences,” Senate Majority Leader Harry Reid (D-NV) said Monday on the Senate floor. Reid said that Democrats and Republicans need to work together on a compromise that would replace "hard-hearted" sequester cuts, and that a budget committee conference is the best way to do so. If a plan isn't worked out to fund the government for the 2014 fiscal year (which starts in October), the ever-efficient Senate will have to agree on a short-term government spending bill. Republican Senators Marco Rubio (R-FL) and Mike Lee (R-UT) have said Republican senators should oppose any short-term bill that includes funding for Obamacare. Doing so would risk a government shutdown. More congressional efficiency! "Any Republican who thinks a government shutdown is a good idea, I suggest they give a call to Newt Gingrich," fired Reid. "He’ll return your phone calls. It was disastrous for him then, and it will be again now."